There are many different brands and types of batteries available for Honda Activa in the Indian market today like Exide, Amaron, Cosmos, Lemon X, etc. Every brand offers different varieties of battery suiting the brand quality and engine capacity of Honda Activa. Following are the 3 different batteries popularly used in Honda Activa. Exide Honda is a Honda Motors Exide Sealed battery Xltz4 with zero maintenance and an X factor. The product dimensions are 11.3x7x8.5cm and the manufacturer part number is FXL0-XLTZ4. It weighs 1.5 kilograms and has voltage of 12 volts. It is manufactured with the world class calcium effects technology. This 4Ah battery has total warranty of 48 months. Under this warranty, it is eligible for free replacement for 24 months, after which there is pro-rated warranty. Exide warranty is valid anywhere in India. The innovative Gas Recombination system eradicates water loss making the battery repairs-free. This battery is an excellent choice for efficient and competitive performance while being potential to bear the rough terrains and tough Indian streets. Exide is one of the most superior brands in India, especially in terms of durability. 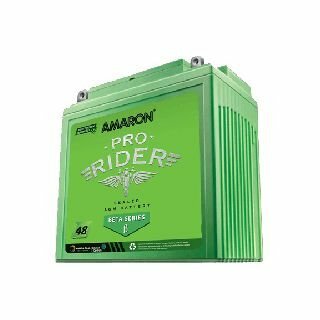 Amaron Pro Rider beta 5AH sealed battery is manufactured with the VRLA technology for Honda Activa available in India. The VRLA technology works on the oxygen recombination principle that prevents water loss and provides zero maintenance. This product includes a rechargeable battery and warranty card. The battery has 4 years manufacturer warranty with 24 month guarantee and 24 month warranty period. The warranty is valid for all India Amaron service centers. It weighs 2 kilograms and has dimensions 5x4x3 cm with the voltage of 12 volts. Both the item model number and the manufacturer part number is Beta5. With this battery supporting the engine of Honda Activa, you don’t have to worry about the road difficulties. The battery takes care of the safety of your vehicle with its high cranking power and high corrosive resistance. The high vibration resistance and spill proof ensures improved safety of the rider long with the durability of the battery. The battery is pre charged from the factory and there is no need for IFC. It ensures long running life of the vehicle without any crisis of frequent repairs or services. Therefore, the rider is not only safe but enjoys the ride as well. BOSS 5LB Sealed Bike Battery is a product from Exide Industries. The item model number and the manufacturer part number is BOSS5LBCDRY. This battery has 18 Months manufacturer warranty. It weighs 2 kg and has dimensions 11.3×8.5.x7 cm with 12 volts voltage. The Battery is fully maintenance-free. The spill-proof design of battery safeguards it against the risk of any leakage, even if mounted in a tilted or inclined position. The highly developed Lead-Calcium technology gives low self-discharge. The Unique Flame Arrestor provides superior protection. The AGM structure gives better-quality cranking power. It is particularly designed to tackle the strenuous circumstances of Honda Activa riding on the Indian roads and specially the narrow- bumpy streets. Boss 5LB battery is applicable to Self (Electric) Start Honda Activa. These Honda Activa batteries price ranges from 400 to 2500. Besides selecting a battery based on its capacity and rating, the choice for battery should be made keeping in the mind the requirements of the vehicle and evaluating how well the battery fits the engine. A good battery will increase the life of the Honda Activa manifold. I purchased Activa 3G in Sep’15, but now battery is not working properly. Excide dealer is denying to replace the battery. Exide batteries fitted with the two wheelers are not upto mark. I am facing Sama issue after 1.5 year.No warranty as per the dealer.